While most of you are busying yourselves with making delicious homemade gifts (I’m assuming because the interwebs are teeming with deliciousness): orangettes and spiced nuts; caramels and hazelnut crinkles; gingerbread and lemon sandwich cookies, just to name a few, here I am making soup. I couldn’t help myself: Ever since we returned from San Francisco, I’ve been plotting to recreate a soup we had at the Zuni Café; the soup that totally stole their famed chicken’s thunder. The chicken, don’t get me wrong, was delicious (it’s famous for a reason), but the soup, oh, the soup—took my breath away. The name, Navy Beans with Swiss Chard, Preserved Lemon and Harissa, immediately caught my eye because preserved lemon and harissa happen to be two of my favorite ingredients. And putting the two together, in a soup no less, seemed to be an act of divine providence. Andrew and I made the mistake of sharing it. As soon as I tasted it, I thought to myself, I hope he hates it. I could have eaten several bowls of just that soup for dinner, and it would have been a fine night. Unfortunately for me, Andrew loved it as much as I did. When we finally came home from all our wintry travels (DC, SF, Boston – oof), I immediately tried to find the soup in the Zuni Café Cookbook. But it wasn’t there. There wasn’t anything even close to resembling it. I was on my own. I remember, while eating the soup, marveling at the tiny, perfectly cut up mirepoix at the bottom of the bowl: they looked like tiny, festive confetti. 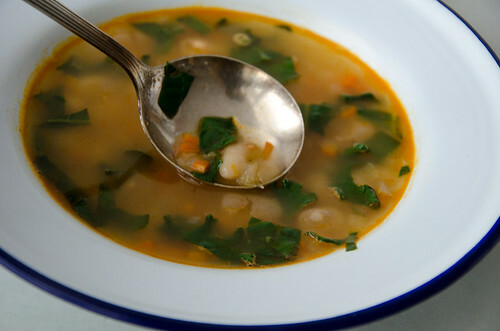 Also in the bowl were plump, silky navy beans, mingling with pieces of the chard, all surrounded by lemon-scented broth. After a few spoonfuls, you felt a warm glow in the back of your throat—harissa. The soup seemed, to me, pretty straightforward, and I decided to give it a go. On my first try, I used chicken broth and found the soup’s flavor to be muddled and overpowering. I went back to the drawing board and tried it with water instead. The soup, while delicious, was lacking something—some body, perhaps. It wasn’t “thick” enough. On my third try, I threw in a small piece of Parmesan rind (which I always have in stock) to see if it would enhance the water-based soup. It did, and while the soup wasn’t as intense as the version with the chicken broth, it was closer to the version we had at Zuni. And it was cleaner-tasting too. In the end, I wound up adding more of both: the lemon juice and harissa to get a slightly more intense flavor out of my broth. If you want your soup to be milder and mellower, use less lemon juice or omit it all together. For me, the preserved lemon wasn’t quite enough this time around, perhaps because I was back in the cold and rainy New York, or maybe because I was nursing a cold. In the end, neither Andrew nor I could quite recall the exact flavor of Zuni’s soup, but we both loved the version that was finally simmering on our stove. And while I have no new Christmas cookie recipe for you this week, I have for you the best thing I found on the internet all week: Representative Earl Blumenauer’s discourse on fruitcake and how he now bakes up to two hundred individual ones to give out during the holiday time. I urge you, as well, to listen to the recording, and not just read the piece he wrote. Rep. Blumenauer has the kind of voice that, I think, belongs on a segment on NPR. It’s nothing short of delightful and will put a smile on your face, something I think we can all use these past seven days. As for the soup, I think it will make a grand addition to any holiday table, Christmas or otherwise. Brothy and flavorful, it doesn’t have much filling power, unless you eat a few bowls and forgo the rest of the meal. Which, if you do, who could ever blame you? For this recipe, I decided not to soak the beans. Well, I sort of didn’t plan ahead, hence the lack of soaking. However, in trying to research soaking vs not soaking the beans, I came upon a few mentions on how, while the beans take longer to cook without soaking, they have better texture and flavor. Since I planned poorly and had no choice, that’s the option I went with. However, should you choose to soak your beans ahead of time, I imagine your cooking time will be decreased by about half. Also, there’s a school of thought that recommends salting the beans only after they are tender. Harold McGee tells us that salting the unsoaked beans before they are tender, does slow the cooking process down somewhat, however it allows for the beans to be properly seasoned. Should you presoak the beans, adding salt to the soaking water will actually cook them faster. 1. In a large pot set over medium heat add enough oil to cover the bottom of the pot and warm until the oil shimmers. 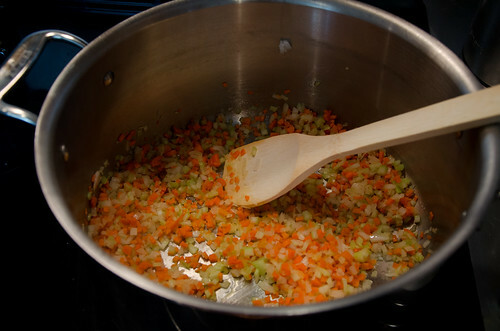 Add the onion, carrot, and celery, stir to combine, and cook, stirring, until the onions and celery are soft, about 4 minutes. Make sure that the vegetables do not caramelize – if the heat is too high; lower it to sweat the vegetables. 2. Add 12 cups of water, the beans, parmesan rind, and salt, and bring the liquid to a simmer. Reduce the heat to low, cover, and cook until the beans are tender, about 1 hour and 45 minutes (see note on using presoaked beans). Season with salt and stir. 3. Remove the flesh from the preserved lemon and discard. Finely dice the rind. Add the rind and harissa to the soup, and stir to dissolve harissa. Cover and let the soup simmer for 15 minutes. Uncover and add the lemon juice. Taste and adjust seasonings if needed. Add the chard or kale and let the soup simmer for 5 minutes before serving. 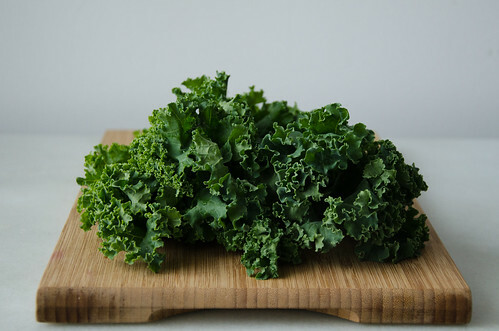 [If using spinach instead, divide spinach across bowls and ladle the soup over the leaves.] Ladle the soup into bowls and serve. It can be so frustrating trying to recreate dishes that we have such fond memories of… But you know what? You made something even better… Something that has your passion in it. It looks wonderful. I have to comment– I have been reading and lurking on your blog for three years now, and have always loved it. Imagine my surprise while reading your delicious soup recipe, and seeing you highlight my boss, Rep. Earl Blumenauer! I’m so glad that you like his fruitcake piece. It is certainly a rare tradition in the Capitol, but it’s a nice way to bring reminders of the season into what is always a crazy December. Brian – thank you so much! Tyler – that. is. amazing. My husband, who sent me the link, heard a rumor that Rep. Bluemnauer gave a fruitcake to the Capitol Hill reporters. Is that true? I just love the piece, love his oral piece on it, and just the sheer spirit of giving. Really wonderful and really lovely especially around now! And I’m so so glad you’re a reader! I hope you love the soup as much as we do here! Happy holidays! It appears that cold and blustery is finally on it’s way east . . . this soup has my name all over it. 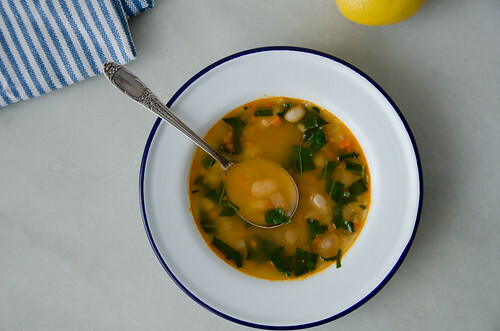 I am out of preserved lemon so I will be scouting out a bag of organic lemons (hoping that I can find meyers) asap and then this soup will be quickly put in rotation. Happy All Holidays. This sounds phenomenal; I’ll happily eat anything with preserved lemons. I wonder if an egg-lemon broth like the one in avgolemono might work as well? katy – it might but i’d probably omit the beans taste wise as it might be just too much stuff. what i like about the soup here is a clear broth. Making it tonight hoping its a hit! I am really fond of soup. I am not a vegetarian, but your recipie forced me to followed. It seems really attractive and yummmy aswell. So I tried it and it was truely a delicious soup i ever made. Thankyou so much for such a nice recipie. Just made it. Delicious. My five year old sat at the table and announced “this soup smells GOOD” and it did. I used small white beans, I think navys would be better texture-wise so will follow that the next time. Swiss chard was delicious with all of the lemon flavors. Melora – so happy you and your family loved it! First of all, thank you for this recipe. It’s been some time I really wanted to try it. I did quite few modifications one late evening after work to warm up our souls: canned beans instead of dry, root of the celery, and the half of the preserved lemon with its insides. It’s a blast! Being of ukrainian origins and therefore having a soft spot for soups, I think this one will be coming often into our regime. Thanks again for sharing it! And I find your blog inspiring our cuisine.